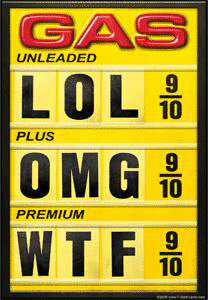 You are currently browsing the tag archive for the ‘gas prices’ tag. Drill Here, Drill Now, Pay Less! I don’t want to really get in a political discussion on my blog. I love politics, but realized quickly that’s a pretty hot topic and some people get heated quickly about it. (I’m not saying I’m not one of those people) If you would like to debate and have a strong opinion about it, please visit Jason’s blog. But I do think that most everyone can agree on lowering gas prices. I for one am getting pretty tired of paying almost 50 bucks to feel up my tiny Toyota Corolla. I mean…c’mon. So Democrat or Republican, Independent or other, I think signing this petition is a really good start to get the attention of our government. Pass it on to others and go ahead and put it on your blogs if you want. Here is the link to the petition. It literally takes 10 seconds to fill out. It’s just your name, email and zip code.